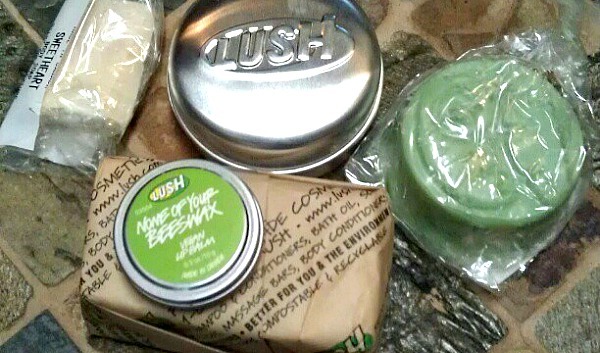 About five weeks ago, I received those lovely LUSH goodies! A lot of you requested reviews, so it's high time I deliver! I bought this bar, because Bobbi recommended it. I have "wild woman" hair despite what my flat iron will have you believe. If Bobbi said it worked for her, I trusted her! For starters, this bar smells divine! Coconut bliss! This bar is for dry, coarse, frizzy hair. I get a nice lather in my hands, and then work it into my hair starting at the scalp. This bar strips my hair of all excess oil (in a good way). It's easy to work in and easy to rinse out. I love this, and I will keep buying it. I had high hopes for this bar! I read great reviews online, and the price was far cheaper than the Veganese Conditioner. Since this was my first purchase, I didn't want to blow too much money, so I decided to give it a go. Like the Trichomania bar, it's gets rid of all the excess oil in my hair, so I never get that smooth conditioner feeling. It works really well, but here is why I've decided I cannot use solid conditioner: It takes 20 minutes to work it into my hair. Way too long! I lathered it in my hands repeatedly, and I rubbed it directly onto my head with success, albeit it labor- and time-intensive. My hair is too thick, and I now know that I absolutely need a more liquid consistency to really work it into my hair. After I use up the rest of this bar, I'm going to buy Veganese! (Until then, I'm melting down the bar so I can skip the extra 20 minutes in the shower.) I'm sure this product would work really well for anyone with average thickness and/or fine hair. Like so many women have confessed, I have a lip balm and gloss collection. This potted balm smells light and delightful. It has a matte finish, but it is moisturizing. My husband appreciates that it doesn't "kiss off" like a gloss. It does need to be reapplied more frequently (although not much), but I'm willing to do that since it's a vegan product. I was originally drawn to LUSH, because most of their products are vegan. Then, I was happy to hear that so many loved the brand, including my favorite cosmetologist blogger, Jenna! Now I like LUSH even more because of quality. I will definitely be buying more LUSH! Which LUSH products do you recommend I try next? Thank you for your reviews! This makes me want to pop over to Lush immediately! Bobbi posted about a deep conditioner that comes in a black pot that I really want to try! Yep, Georgina, it's called "Retread"! I've also used "American Cream", they're both great! I went into a LUSH because I'd heard so many great things about their products, but I was disappointed that none of the shampoos (in shop) are SLS-free. They do have a few on the website, but I am a very picky "smell before I buy" shopper, and I can't do that online. That said, I bought a few body washes, and the Happy Hippy is great, the Porridge soap smells AMAZING and the little nubbies exfoliate great, and the sugar scrub is another great exfoliant. I hope they expand their SLS- free line, but until then, this dry & curly-headed girl won't be using their shampoos... glad they worked for you, though! The bath bars and bath bombs that Lush has are awesome =) They make your bath water smell good and make it very silky as well. So funny! I did a review today too! Great minds think alike. :-) I'm going to have to check out Lush. I'm happy to hear that they're vegan & not tested on animals!! Hope you had an awesome trip!! Just recently went there for the first time and cannot say enough good things about their products. You should try Ro's Argan body conditioner, it smells amazing and my skin has never been so soft. Thanks for the review! I've never heard to Lush. I am not a vegan either but like you are taking small steps to a better me! Great review Lindsay! I would love to try some of these vegan products and now that I know what did and didn't work for you I feel more confident about buying this brand. I LOVE LOVE LOVE Karma Koomba shampoo. I highly recommend you go to lush and just ask for a sample, they give them out for free. If you don't have a Lush nearby, I will totally ship you a sliver of mine. I've been using it forever (along with the jungle conditioner) and I'm ADDICTED to the scent.